An Englishman in Colombia: Different! It's been an unsual day today, it was the usual start, dogs walked, Marcela's breakfast prepared for her to take with her to work, and then sit down for an interview at 9am, I had been asked if I would take part in Research on British Expats in Colombia, the Researcher was a very nice Colombian Lady married to a Brit, and currently in the UK, so it was a skype interview. I'm not sure whether it was because she put me at ease, or because I talked the pants off her (figuratively speaking! ), but when it ended I couldn't believe one hour twenty minutes had passed. Then it was time to change and get back in the garden, I bagged up all the cuttings from the Dame de la Noche, it will take a while to get rid of them, as I will only put a couple of bags out for the bin men at a time, because I don't want to push my luck, and end up unable to dispose of them. That done, I decided it was time for an early lunch, then a shower, followed by some work in the office, time has flown, it is nearly time for Marcela to come home, and I haven't even thought of having a siesta. No day would be complete without something controversial, and today is no different. When I was out walking the dogs this morning, I saw a motorcycle parked up, I had seen the offending machine yesterday, but today I took the photo I wanted. Motorcycles here are seen as a necessary form of cheap transport, cheap because many people don't have them street legal. They won't be insured, even with the obligatory third party insurance, they are not maintained, and because they pay out nothing on them, if it looks as if they are going to be stopped they abandon them, or if stopped and the bike is seized it is not worth reclaiming. 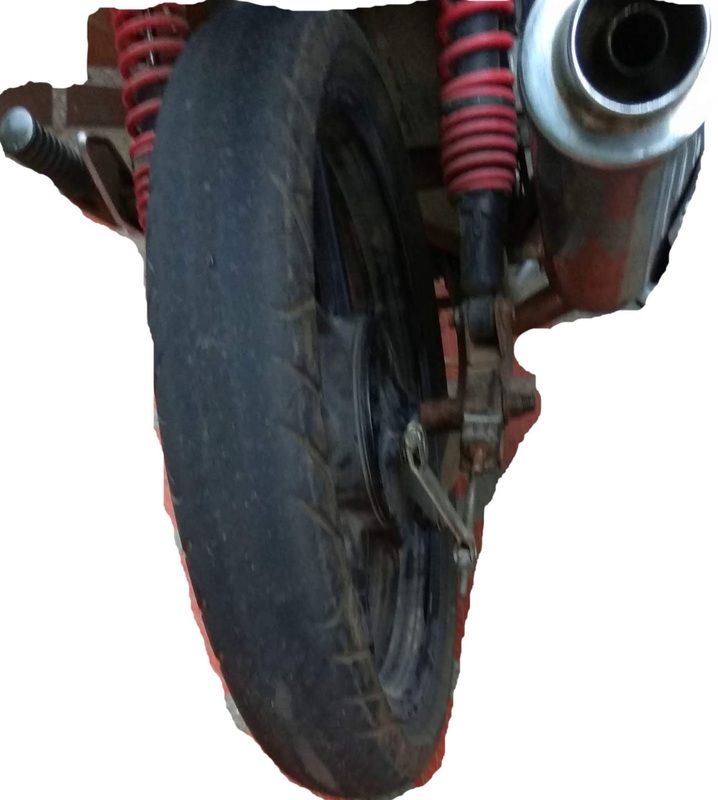 as on this bike the back tyre is completely devoid of tread, the inner cord is showing through near the bottom of the photo, and yet they use them on our badly maintained mountain roads, without any thought for themselves or other road users. Do the Authorities do anything about it?...No, they at best stop nearby and let the owner know they have been seen, and the bike is quickly put out of sight, it really is pathetic.